Students are introduced to west African kingdoms by drawing conclusions about an image of a mosque in the country of Mali. Then they examine the history of several west and central African kingdoms as well as the role of trade in those kingdoms. Next, they explore the empire of Mali and Mansa Musu and explain how trade influenced his empire. Finally, students analyze the early internal African slave trade. In this experience, students are introduced to west African kingdoms by drawing conclusions about an image of a mosque in the country of Mali. 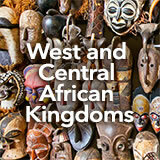 Then they examine the history of several west and central African kingdoms as well as the role of trade in those kingdoms. Next, they explore the empire of Mali and Mansa Musu and explain how trade influenced his empire. Finally, students analyze the early internal African slave trade. 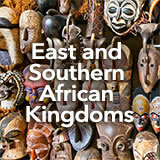 Describe the society, economy, and religion of the west African civilizations of Ghana, Mali, and Songhai. Look at the above photo and see if you can answer these questions. If you don't know, try to make an educated guess. The photo is of the Great Mosque of Djenné, a mosque in the west African country of Mali. The original mosque on this site was built during the 13th century. Both the original and this replacement, built in 1907, are made of earth. Based on the photo, what might you assume about the geography or climate of this area? Discuss student responses. Students will likely assume that the geography and climate are desert, dry, and hot because the image shows a lot of sand, no vegetation, and even an animal that looks to be skinny and perhaps starving. Additionally, the mosque is built of earth and sand, something that would be easy to create from the sandy desert and baked in the hot sun. In this experience you will learn more about the old west African kingdom of Mali as well as several other kingdoms of that region.